Our natural desire for beauty and instant gratification has created a new wave for cosmetic procedures and aesthetic medicine. When it comes to non-surgical cosmetic procedures, the two most common categories are dermal fillers and injectables, which for most, the household name 'Botox' comes to mind. When searching for the cost of fillers and injectables it may be difficult to find a straightforward answer, so we’re going to break it down to give you a more realistic idea of what to expect when you get your final bill, and what factors to take into consideration that might affect your total. However, it’s important to note that the costs listed below are estimates only. 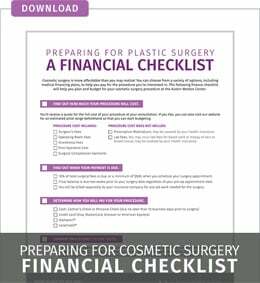 For a more precise estimate, schedule a consultation with a plastic surgeon or a certified aesthetic nurse injector to determine what you will need and the cost. When it comes to options, there is no shortage of the variety of choices and brands of cosmetic injectables, but the two most popular treatment options can be broken down into two categories: neurotoxins and dermal fillers. The term 'neurotoxin' is a fancy name for an injected medication that stops muscle movement. If wrinkles are due to over-movement of muscles, then a neurotoxin can help the movement to decrease, thus softening the wrinkle. The most popular neurotoxin, also sometimes called a neuromodulator, is Botox, but other brands like Dysport and Xeomin work similarly. As with most procedures, the cost of cosmetic injectables is going to vary depending on the person and your desired results. So, we’re going to provide a cost breakdown for the most popular injectable, Botox® Cosmetics. There are two major ways Botox is billed. One is per unit. Essentially, your provider makes their best guess as to how much Botox you will need to relax over-moving muscles, and you pay that amount. The downside of estimating is if they underestimate and you require more product, you must pay for that extra product. Practitioners sometimes undertreat in this model to save money. The other treatment model is a flat fee by area. For this, a patient pays a flat fee, the provider treats to completion, and if any additional product is needed, the patient does not have to pay a ‘touchup fee.’ The downsides to this model are that the cost may be more expensive up front, particularly for one area of treatment. Flat rates are usually somewhere between $450 and $1000, while per-unit prices are typically around $10-20. Austin-Weston uses a flat fee for Botox. One area costs $450, two areas costs $650, and three areas are $850. The price is the same for Dysport and Xeomin as well. Austin-Weston uses a graduated pricing model for fillers. In general, the first syringe is full price, and subsequent syringes are $200 cheaper. Certain products have a higher market share and therefore reflect a premium price. One example of this is Botox, which is the industry leader in neurotoxins. The cost of Botox is at a premium. At Austin-Weston, all neurotoxins are charged at the same rate for simplicity and patient convenience. There is power in bulk buying in plastic surgery, just like in other areas of business. The more product a practice uses, the better price they receive from vendors which allow busy or high volume practices to keep costs down. One way of telling practice volume is the Black Diamond seal, a distinction given to practices by Allergan, the company that makes Botox. Austin-Weston has the distinction of being awarded Black Diamond status and is recognized as one of the top 50 practices in the nation regarding volume of injectables performed. The most important factor for you to consider as a patient, whether for a surgical procedure or non-surgical, is selecting who will do the treatment. This can be accomplished by checking on the surgeon’s online reviews and reputation. Another part is meeting the doctor in person to make sure they understand your concerns, and that you have a good feeling about interacting with the doctor and having your needs met. A highly experienced board-certified plastic surgeon may charge more than a less knowledgeable or respected doctor, but that isn’t necessarily true. Some novice surgeons seek out wealthy clientele using aggressive marketing, but after reviewing that doctor’s credentials, they may not be who they claim regarding experience, board certification, or skill. All surgeons have their approach to performing plastic surgery procedures as each doctor has different amenities at their disposal and varying levels of experience and accreditation. For injectables in Virginia, mid-level practitioners such as physician assistants and nurse practitioners can also perform injections, and it is important for patients to do their research on their qualifications and association with an accredited facility. For patients interested in a more budget-conscious procedure, Austin-Weston also offers injections by a qualified Nurse Practitioner. These injections are on a per unit basis. The American Society of Plastic Surgeons (ASPS) lists the national average of plastic surgery physician fees. These prices vary widely among regions, with plastic surgery hotspots like Manhattan, Beverly Hills, Miami, Dallas and Los Angeles at the higher end of the spectrum. More lightly populated areas like North and South Dakota, Idaho, Mississippi and Arkansas charge much less. Mid-level costs are incurred in Phoenix, Tennessee, Ohio, Indiana, New Mexico and Illinois along with locations away from the major cities within high-priced states. The reason plastic surgery costs vary based on geographic locations, such as major urban centers, is usually due to higher overhead costs for surgeons in these areas. So, the first step in considering what you'll pay is looking at fees where you live and how much the cost of living is in that area. To find ballpark prices for procedures based on location by using the Healthcare Blue Book (it works the same way Kelley Blue Book lists the prices of cars).